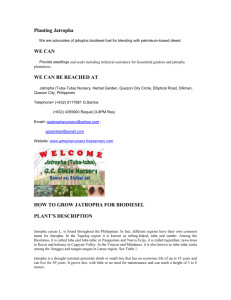 feasibility study fair trade Jatropha certification. 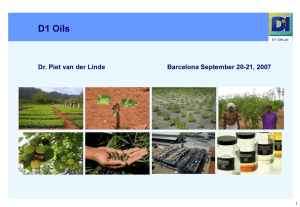 the production of Jatropha oil from the plant Jatropha curcas L.
growing Jatropha curcas as a crop. generate some additional income. Cultivating Jatropha should by no means disrupt this process. without competition and soil depletion. understanding of the environmental conditions these plants need to grow and thrive. 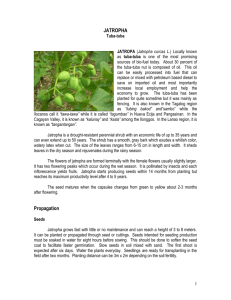 (at least) the soil conditions since there is very little information about Jatropha itself. most suitable way to propagate Jatropha. Therefore the second module is about seed selection, nursery and propagation techniques. achieve a high yielding Jatropha crop. Therefore the third module is about field activities. products are being mentioned in module four. Unless otherwise stated, pictures and graphs are produced by the author. to locally differing circumstances, beyond control of the author. Jatropha genus has many ornamental species a well. therefore sometimes grafted on Jatropha curcas. States. It is also used as a house plant. a living fence and a marker tree. Many parts of the plants are used in traditional medicine. of up to 5-7 m. Dormancy is induced by fluctuations in rainfall and temperature/light. Ratio male to female flowers 13:1 to 29:1.
are mature. The 3 seeds are black, 2 cm long and 1 cm thick. 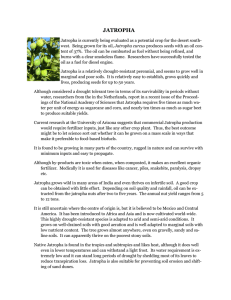 wild plant into a crop, without the back up of existing solid agricultural crop science). can be further sub-divided into humus, roots, and living organisms. The values given above are for an average soil. The first and very rough characterisation of soils is based on visual aspects. Most soils are characterised by the presence of clay, silt and sand. Particle size ranges for sand, silt, and clay. Heavy soils (clay, silt) do have a texture determined by very small particles. (see table 2). degradation. In tropical area’s it is much more difficult to maintain a good soil structure. plant, is decomposed very vast by high temperatures, high humidity and intensive labour. Never work a soil when it is to wet! good drainage leaches the available nutrients very fast, so light soils are mostly poor soils. soils, as long as there is proper drainage and/or run off. occurs in the range 6.0 to 7.0. Table 3. Relative availability of nutrients to plants depending on soil pH. Table adapted from R.E.Lucas and J.F.Davies. Without water plants do not grow. With to much water they do not grow either, except for e.g. elements, responsible for growth. Plant cells contain a lot of water. plant suffers lack of oxygen. Root system of potato at different water tables. heavy soils are usually fertile soils, Jatropha will grow and produce very well on these soils. the same reasons these soils have a tendency to become very dry. Nutrients and their specific role in plant growth. Table 6.Plants contain practically all (92, periodic table) natural elements but need only a few for good growth. nutritional (macro)elements for plant growth. N. Nitrogen can be applied both as an organic or inorganic fertilizer. fertilizers. Their secondary benefit is that they will acidify (lower the pH) gradually. more expensive and less specific. therefore at most important when Jatropha is being planted. of rock phosphate, which is an excellent long lasting fertilizer. sufficient nutrients. Foliar application of P will also stimulate flowering. more branching and more flowering. In annual oil seeds like sunflower, sufficient P increases both yield and oil content. catalyst, regulating enzymatic processes in the plant that are necessary for plant growth. drought and pests. It makes a plant tough! Compared with N, P and K, the other nutritional elements are needed in very small amounts. Practical solutions for yield improvement. organic mater content, soil organisms. factors. (example table 9), which are not always nutrient related. Knowing the pH of your soil makes it easier to understand growing problems in the field. goes down) can be very expensive. It also has to be repeated after a couple of years. soils samples on a regular base, to find out the real growth limiting factor. Fertilization at planting or replenishing lost nutrients can be done via different means. avoiding leaching by heavy rain. N fertilization is a non starter. research to find out if a Mycorrhiza treatment can and will be effective or not. already grow. It can also become a useful raw material for industrial and energy production. Average yearly yield of 20 individual plants documented over 4 years. Therefore proper plant selection is crucial for the development of a well yielding Jatropha crop. Propagating large quantities of Jatropha curcas is not a complicated task as such. growing very fast, so they have to be moved and planted very fast as well. take years to benefit from the results. collection and observation from plants grown out of local seeds. Vigorous plants are healthy and usually do have less problems with diseases. However, vigorous plants are not always high yielders! ones you are looking for. proper care and data collection. It is the type of project that dictates the type of nursery needed. as possible to the plantation site, in order to avoid long distance transport of plants. 4. A simple storage for material like poly bags, watering tools etc. The size of the nursery should be adapted to the number of plants being produced. several cycles could be realized within one year. seeds with different size, different colour, damaged seeds etc. Seed for propagation should never be dried in direct sunlight. after 6 months, if properly stored. Seeds older than a year should not be used for propagation. crops in the same way. needed for each planting hole. complete they should be watered as per need. Seeding in beds and transplanting into poly-bags. beds for drainage and walking. used, but only river sand also gives good results. be kept in the seed bed for at least 6 weeks. Propagation by hard cuttings in poly bags. (hard cuttings are parts of fully grown Jatropha plants). How to make as many hard cuttings as possible? the wood should be greyish. Green wood is too young and can easily be attacked by fungi. will damage the cuttings. Cut the stems slightly slanted. Let the cuttings dry in a shady place for some hours. available material before you start a big nursery. The trial takes you only 4 weeks. should have a length of 20-40 cm. should have a minimum length of 40 cm. sense when high yielding jatropha varieties have been selected. Soft cutting method from IPB-Indonesia. 2. Soft cuttings are placed in small tunnels under shade. Preparations for planting the mother-plants. should be mixed with the soil. The mother-plants should be planted at a spacing of 50 per m2. Preparations for planting the cuttings. should have parabolic shape in order to avoid accumulation of excessive moister in the centre. dust has to be moistened but not wet. In stead of saw dust, good quality coco peat could be used as well, probably with better results. Coco peat should be tested on salt content. or 3 leaves should be cut with a sharp knife or razor blade. weeks the cuttings should be ready to be transplanted. difference in the way the plants get established and make a root system. claim. On top of that, there is no data regarding yield in relation to root system. supposedly more vulnerable to drought. Again there is hardly any data supporting this. yielding earlier than seedlings, due to the fact that cuttings usually come from adult plants. Jatropha intercropping and Jatropha hedges. 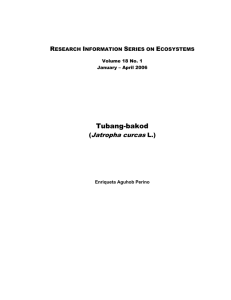 Land preparation for Jatropha monoculture. is an excellent way of creating a water buffer in the soil. Land preparation for proposed intercropping. Land preparation for planting hedges. becoming a blessing in stead of a curse. Jatropha hedge can produce 800 kg of seeds. tolerant when it comes to herbicides. pruning, light, water and nutrition. light and the branches will stay “blind”, in other words they do not produce flowers. the frame work and dispose of any useless branches. Always use secateurs to prune. Machetes make nasty wounds with infection risks. total yield and it will take years to build up a good yielding plant again. initiation takes place shortly after the plant receives its first water. picking. On top of that, the brown and black fruits are easier to dehull than the yellow ones. force Jatropha into equal fruit ripening. the Jatropha alleys and the intercrop. will enhance food production as well. Planting more than one crop in the same field has many advantages. crop failure and anticipating on erratic rainfall. can use their time more economically. 3. With a better coverage of the area, weeds are suppressed. 4. Pest and disease incidence is lower with intercropping. type of intercrop and/or the equipment which is going to be used. rich in N, P and K, equal or even richer than chicken manure. 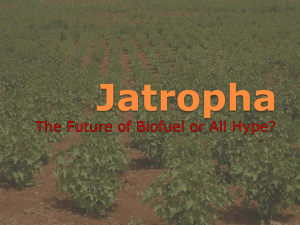 How can Jatropha benefit from intercropping. production of honey, provided there is water available for the honey bees!! verify the characteristics of a plant before you introduce it. given to grow the right type of pasture. see any fungus or insect attack. are observed in actual Jatropha plantations. you are using the pesticides at your own risk. In some countries this is an offence. stoves and lamps commercially available. the oil into glycerine and biodiesel. will go white and soon it becomes creamy. regions. Then it can be released from the mould and cut if necessary. stored for some two weeks on shelf before sale. due to its high price and poor marketing, it can not compete with industrial soaps. but it is absolutely necessary in order to get rid of the oil in the de cake. sludge from the bio digester again is an excellent seedcake which can be applied directly. In Tanzania mixtures of Jatropha oil with used engine oil are being used as wood preservative. fires because it smokes a lot. The fibers are made from the Jatropha bark and/or wood. Bark alone gives a greenish color. Wood or bark is left soaking in water for some days and than pounded to obtain the fibers. until it forms a uniform thin coating. The fibers are allowed to settle and the water to drain. for water color, for instance, is heavily sized, and can be fairly soft. roots in the rotted area. area. Therefore new accessions will be imported. beds of 1 mtr wide and 40 mtr. long. The beds should be used for transplanted seedlings in polybags. In roughly 20 weeks this nursery can produce 60.000 transplanted seedlings ready for distribution. cm.) 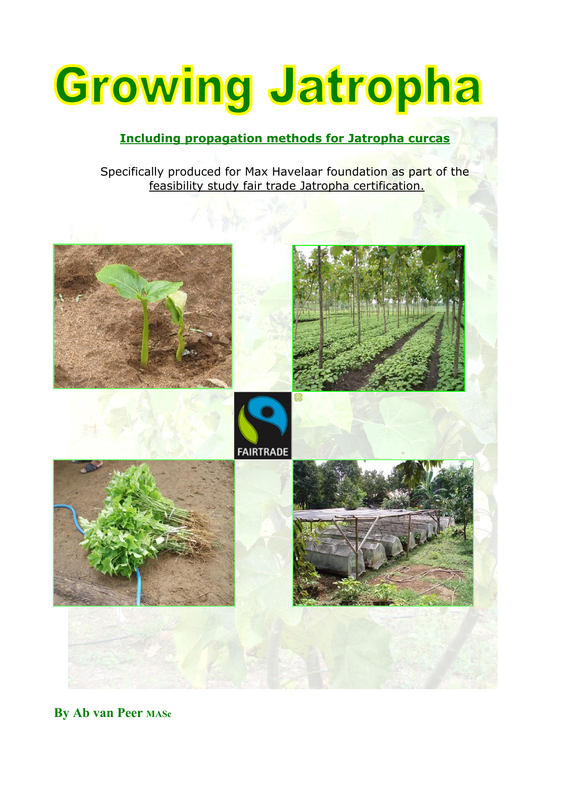 In between the Jatropha rows a surface of 3120 m2 (60%) remains for other intercrops. Implementation of the demonstration plot. Additional: Seeds for selection plots. 2. For 40 pilot farmers. Total area 20 ha=20.000 plants. Jatropha plants for intercropping receive 1 kg of manure per plant. Total manure for Jatropha=2 mt to be distributed to farmers. the pilot plot and provide local farmers with planting material. of the area is walking and working space, there is 1200m2 available for growing plants. This can be divided in 30 beds of 1 mtr wide and 40 mtr. long. Seeds should germinate within 10 days. Be careful not to overwater the seedlings. Bimonthly observations on all individual plants. growth, frequent branching and full fruit branches. label, showing the selection number and the date of seeding. date of planting and the selection number. For each selection, data have to be collected as shown on the selection trial form. 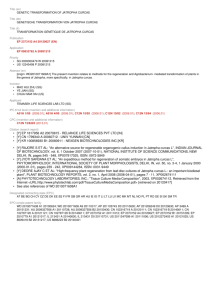 Compare various accessions in order to define the best accession for a particular area. of the experimental plot, showing the number and the location of each individual plant. Non fert ilized ro ws with farmers seed. the demo is only applicable as soon as Jatropha flowers. be measured have to be marked with sticks and signs. To grow Jatropha, different planting systems are possible. 1. Planting of hedges around farmers plots. side), the planting area should be properly cleaned from weeds and debris. Planting hedges is generally done with cuttings, planted very close together (10-15 cm). meter. Once grown, cuttings from these plants can be planted in between the existing plants. 2. Planting Jatropha for intercropping. 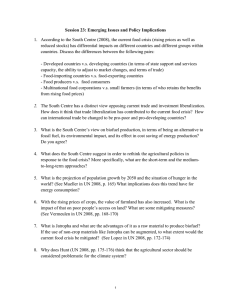 with the other crops and the yield of these crops will decrease because of this competition. 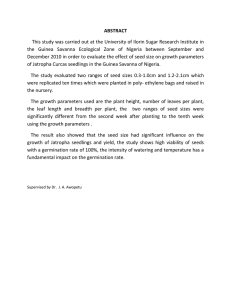 Therefore a new intercropping model is introduced. slope, the Jatropha rows should be planted along the contours to avoid soil erosion. 1. Preparing planting holes. Planting holes should be prepared well in advance of planting. manure, cow manure or decomposed seedcake. Plants should be taken out of the plastic bag (cut the bag but keep the root ball intact. 11. Influence of pH on nutrient availability. R.E.Lucas and J.F.Davies 1961.